Folks, if your elderly mother had a “medical episode” and came to your place, would you allow her to walk back alone to a car across a wide sidewalk with no one by her side when she left? Hillary was surrounded by her SS agents at the memorial and when they heaved her into her black ambulance – they were like glue (as they should be), and yet when she emerged from Chelsea’s pad, she walked across the very wide sidewalk, stood there in front of press to show how “healthy” she was (the press were across the street so they couldn’t get a good look at her) , hugged the child, and NO SS AGENTS were there surrounding her. She is always tightly surrounded by her entourage; six or more SS agents, her Dr., a nurse and an aide. Where were they all when she came out of Chelsea’s apt., especially the SS agents? And how did she suddenly look like she was 40 lbs lighter? And where did all of the sudden energy come from as she bounded down the sidewalk if she had pneumonia? No Chelsea helping her mother out to the car, no doctor at her elbow in case she went down again. Also did she come down the elevator inside by herself unattended? Were they inside watching her? Or maybe Hillary wasn’t there at all. Did anyone see the doctor emerge? This only makes sense if it was not Hillary, but instead a double. See those blue eyeglasses Hilliary is wearing? The Zeiss Clarlet Z1 F133 spectacle lens is a deep blue coloured lens that transmits regulates the transmission of light across the visual spectrum. Primarily wavelengths in the blue and green portion of the visual spectrum are transmitted to varying degrees. Light in the yellow, orange and part of the red portion of the spectrum is blocked. The Zeiss Clarlet Z1 F133 spectacle lenses are manufactured in Zeiss’ precision tinting laboratories in Aalen, Germany where over 7000 lenses are produced daily for many practical and therapeutic uses. The Zeiss Clarlet Z1 F133 spectacle lens is cosmetically a similar density to a dark sunglass lens. It is not possible to lighten the colour of these lenses without affecting their spectrum of transmission. Patients will need to adapt initially to a blue cast over objects. However, once the initial adaption has passed more normal colour perception should be achieved. Educators of patients who wear Zeiss Clarlet Z1 F133 spectacle lenses should be counselled that patients wearing these special spectacle lenses may have some difficulty perceiving certain colours. Therefore special consideration may be required to ensure that educational information is not missed in visually orientated presentations. They are designed to prevent seizures due to epilepsy. This information is provided to assist patients with Photosensitive Epilepsy and their carers to understand the possible benefits of Zeiss Claret Z1 F133 spectacle lenses in managing their condition. please discuss this with your Neurologist or Medical Practitioner as to whether these spectacle lenses may assist your particular form of epilepsy. This was back in 2013 when she was testifying before Congress. May be a bit hard to see but notice the lines behind the glasses' lense on her left (our right). That is a prism made from plastic and used to prevent double vision. I ought know. I had to use these at one point with my own glasses. I was told mine was common and caused by my Diabetes II. There is no explanation given for why she needed them. WASHINGTON – Secretary of State Hillary Rodham Clinton’s new eyeglasses aren’t just a new look — they have a special lens that’s used to treat double vision, eye doctors told The Post. 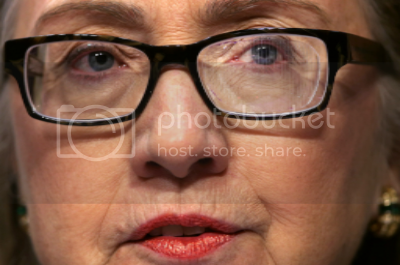 Clinton, recently treated for a blood clot near her brain after a fall, wore the Fresnel lens to aid her left eye during the Benghazi hearing. “This kind of prism helps for people who are experiencing double vision,” said Dr. Vike Vicente, a pediatric ophthalmologist in Bethesda, Md.